JULY 9, 2018 — GRAND RAPIDS, MICHIGAN — "This is a once-in-a-lifetime opportunity," says Brenda E. Austin, artistic director of Detroit Handbell Ensemble. 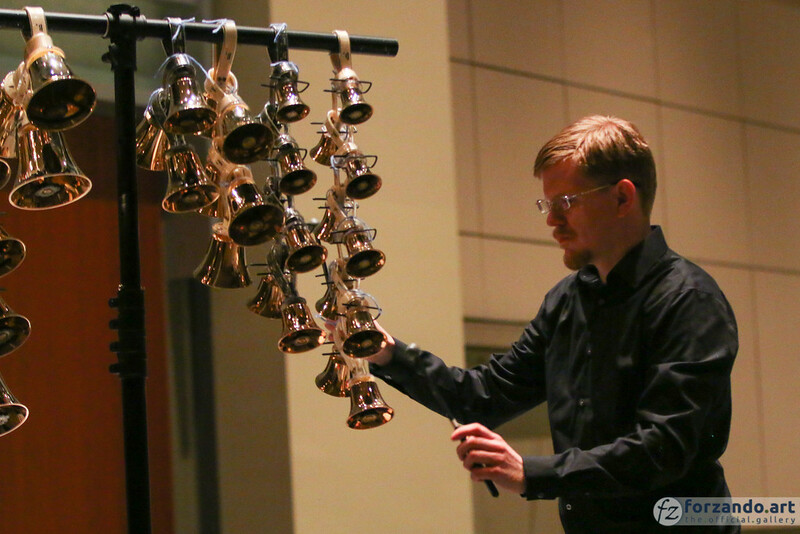 For Daniel M. Reck, though, the performance at the 2018 Handbell Musicians of America National Seminar is a return visit. He is joining the Detroit Handbell Ensemble for its ad will be featured playing bell trees with Ellen Woodard. Reck is a handbell soloist from the Shadows of Bronze and has performed handbell music across North America and Europe. He has previously performed with the premiere Agape Ringers in Illinois and with the Handbell Musicians of America All-Stars. Reck and Austin, both long-time conductors and published composers, look forward to the challenge of performing for their peers. JULY 4, 2016 — TULSA, OKLA. — A recording including Daniel M. Reck performing with the DePauw University Band is featured on this week's episode of Wind & Rhythm. The weekly program is carried on select public radio stations. The episode, "A Birthday for Our Country," can also be heard via the player at the end of this story. "We're in good company" for this patriotic episode, says Craig Paré, conductor of the DePauw University Band, "with other performances by the United States Marine Band 'The President's Own,' the United States Air Force Band, and the United States Army Field Band." The episode features the band's recording of "The Star Spangled Banner (A Love Song to our Country)," arranged by Jack Stamp. APRIL 15, 2015 — BALTIMORE, MD. — Daniel M. Reck and collague S. Reed Cooper presented a session about managing organizational change to a packed room today at the national conference of the American Association of Collegiate Registrars and Admissions Officers (AACRAO) in Baltimore. Immediately afterward, former U.S. Secretary of State Madeleine Albright, addressed the gathering. "We shared models and perspectives about managing organizational change as a small office," says Reck, the associate registrar on Midwestern University’s campus in Illinois. "We have just four staff members but are responsible for rolling out programs that affect the entire university." "Often these conferences focus on change management in large offices with twenty-plus staff members," says Cooper, Midwestern’s registrar in Illinois. Their session instead explored case studies of small offices effecting large changes. They examined how each individual member of that small office can have a significant impact on the success of the work. APRIL 6, 2015 — DOWNERS GROVE, ILL. — Next week, Daniel M. Reck and S. Reed Cooper will present a session at the The American Association of Collegiate Registrars and Admissions Officers conference in Baltimore, Md. "We will be discussing approaches to managing organizational change as a small office," says Reck, the associate registrar at Midwestern University's campus in Downers Grove, Ill. "We have just four staff members but are responsible for rolling out programs that affect thousands of people at our institution." Their session, which is scheduled for 10:30 a.m. on April 15 at the Baltimore Convention Center, will explore case studies of small offices effecting large changes. They will also examine how each individual member of that small office can have a significant impact on the success of the work. Daniel Marshall Reck is an educator and multidisciplinary artist with music and photography published by forzandoArts. Do you know an organization that needs technical and creative expertise?